Entering week 3, hopefully you’re starting to get the hang of Daily Fantasy Football contests. We're now figuring out which defenses aren’t as bad as we thought (Redskins), and which offenses aren’t as good as we thought (Eagles). Once again, we’re here to share some of our favorite Week 3 value picks on FanDuel and that means finding good players at good prices, AKA value picks. You have to remember to look at these players differently than you would in your traditional Fantasy Football leagues. For instance, you would never consider starting Ryan Fitzpatrick in your season leagues but, as one of the cheaper FanDuel quarterbacks, checking in under $7,000 in salary he’s not a bad option! After posting our Week 3 Fantasy Rankings, and going through the FanDuel salaries, I came up with a couple of my favorite Week 3 value picks at each position. Each week, my goal is to find a decent high-priced player that will give you a good return on investment, and a cheaper value play that will allow you to spend more money at other positions. Let's take a look at some solid value picks, using the Fantasy Knuckleheads FanDuel Optimal Lineup Tool and help you set up a winner! Tyrod Taylor, Buffalo ($7,000) at Miami: Just a couple weeks ago, Taylor was an even better value, costing just $5,000. He’s averaging 40 rushing yards per game, and the Dolphins defensive line will definitely have him on the run early and often. At 2.6, he’s the best value at quarterback in the Fantasy Knuckleheads FanDuel Optimal Lineup Tool. Luke McCown, New Orleans ($5,200) at Carolina: If Drew Brees (shoulder) isn’t able to play Sunday then McCown will get the keys to the Saints offense. Granted, it’s not quite the high-flying passing offense it once was, and the Panthers have only allowed two passing touchdowns this season, the value is there. Latavius Murray ($7,000) at Cleveland: Currently, Dave Richard of CBSSports.com would rather have Latavius Murray on his yearly team than DeMarco Murray, who has just 11 rushing yards so far. Considering the Browns have allowed an NFL-high 320 rushing yards so far this season, at 4.8 yards per carry, we like us some Latavius Murray this week, too! Danny Woodhead, San Diego ($6,400) at Minnesota: There are still 30 running backs with higher Week 3 salaries, but Woodhead has nine touches in the red zone – compared to zero for rookie Melvin Gordon through two games. Julian Edelman, New England ($7,700) vs. Jacksonville: The Jaguars defense is better than last year’s unit, which means teams will be forced to pass on it a little more before coasting on their running games in the second halves. Edelman is averaging 15.5 targets per game – best in the NFL by 2.5 – and we like the Patriots using him again here. Kendall Wright, Tennessee ($5,900) vs. Indianapolis: Will the Colts go a third game with scoring issues? We think not, which means if they score a lot – the Titans will have to go through the air a lot to catch up. Wright should see double-digit targets in this game from Marcus Mariota. He doesn’t have a high ceiling, but he’s a sweet price. Rob Gronkowski, New England ($8,400) at Jacksonville: Even at this high price, Gronk is underpriced. If you’re playing cash games, like 50/50s, Double-Ups and Head-to-Head plays – he needs to be in your lineup as a reliable stud. Martellus Bennett, Chicago ($5,600) at Seattle: With Alshon Jeffery battling hamstring problems, and Jimmy Clausen possibly helming this offense, Bennett should see plenty of targets against the Seahawks. Seattle’s defense has allowed a pair of touchdowns to tight ends already this season, and they allowed 11 TDs to tight ends all of last year (tied for third-most in the NFL). Stephen Gostkowski, New England ($5,000) at Jacksonville: The Patriots offense is on fire, and even if they get out to a big lead, they’ll run it a lot and end up with plenty of second-half field goal opportunities. 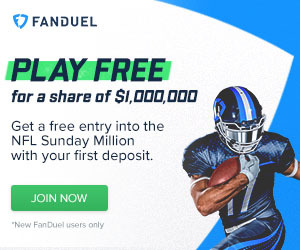 Kyle Brindza, Tampa Bay ($4,500) at Houston: Kicking in a weather-controlled environment is a good thing, and FanDuel rewards long field goals. The rookie out of Notre Dame kicked a pair of 50-yarders in Week 2, and he should see several chances again this week. Arizona Cardinals Defense ($4,700) vs. San Francisco: One thing I like to look for when I choose a defense in Fantasy is the Vegas lines. I try to find a game that’s expected to be a low-scoring affair, with a low over/under line, and then I look to the favored team, and I use their defense. In Week 3, there are only four other games expected to have a lower total score than the Cardinals/49ers (44). But the Cardinals are favored to win by 6.5 points, which means the final score of both teams would be around Cardinals (25) over the 49ers (19). N.Y. Jets Defense ($4,500) vs. Philadelphia: The J-E-T-S played the high-powered Colts really well in Week 2, and now the troubled E-A-G-L-E-S are coming to East Rutherford. We expect more deer-in-the-headlights looks from Sam Bradford during this game, too. Good luck with our Week 3 value picks, and make sure you run your prospective FanDuel lineups through the Fantasy KnuckleHeads FanDuel Optimal Lineup Tool!